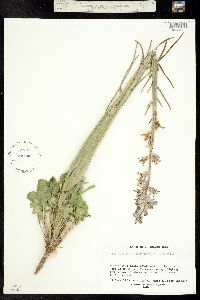 Caulanthus crassicaulis (Torr.) S. Wats. Perennials; glabrous or sparsely pubescent. 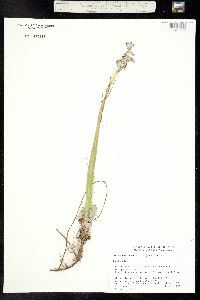 Stems erect or ascending, usually unbranched, rarely branched, (hollow, strongly inflated, fusiform, to 3 cm diam. at widest point), 2-10 dm. 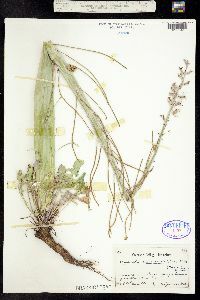 Basal leaves rosulate; petiole 0.5-9 cm; blade obovate to oblanceolate (in outline), 1-12 cm × 3-45 mm, margins entire, dentate-sinuate, lyrate, runcinate, or pinnatifid. Cauline leaves (distalmost) shortly petiolate; blade linear to narrowly oblanceolate, margins entire. Racemes (densely flowered), with a terminal cluster of sterile flowers. Fruiting pedicels ascending, 1-5 mm, glabrous or pubescent, (trichomes flattened). 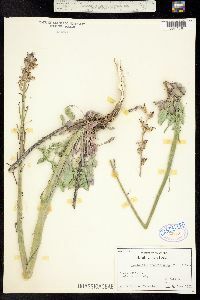 Flowers: sepals erect (creamy white, purplish, or greenish), ovate to lanceolate, 7.5-14 × 2.5-4 mm (equal); petals brown or purple, 10-15 mm, blade 3-5 × 1.2-2.5 mm, not or hardly crisped, claw oblanceolate, 7-10 × 2-2.5 mm; filaments tetradynamous, median pairs 3-8 mm, lateral pair 2-7 mm; anthers narrowly oblong, equal, 3-6.5 mm. 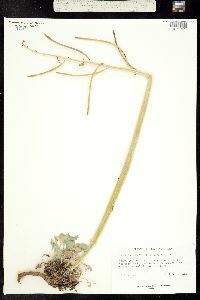 Fruits erect to ascending, terete or slightly latiseptate, 4.5-14 cm × 2-2.5 mm; valves each with obscure midvein; ovules 98-126 per ovary; style obsolete or, rarely, to 0.6 mm; stigma strongly 2-lobed (lobes to 1 mm, connivent, opposite valves). Seeds 1.5-4 × 1.5-2 mm. 2n = 28. Flowering Apr-Jul. 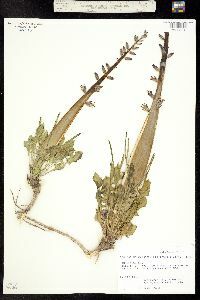 Sagebrush scrub, pinyon-juniper woodland; 1200-2900 m; Ariz., Calif., Colo., Idaho, Nev., Utah, Wyo. 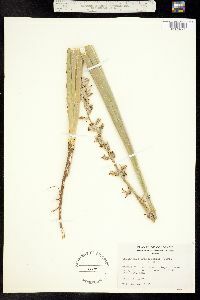 E. B. Payson (1923), R. C. Rollins (1993), and R. E. Buck (1995) recognized two varieties of Caulanthus crassicaulis and separated them solely on the basis of var. 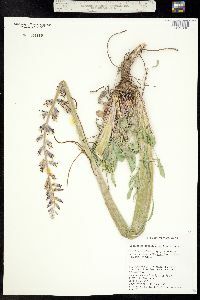 crassicaulis having pubescent sepals and glabrous or pubescent leaves, and var. 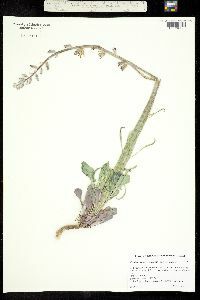 glaber having glabrous or sparsely pubescent sepals and glabrous leaves. In my opinion, this distinction is impractical; as in some other species of Caulanthus, both glabrous and pubescent forms occur sometimes within the same population.